SPT’s NoisePrint mills will cut 3-4 miles an hour, and it is necessary that the sweeping operation stay close behind our mills to prevent the debris from sticking inside the cuts, and to keep the moving operation lane closure together. In most cases, state specifications allow contractors to sweep the debris over the shoulder’s edge. On shoulders that are 6-feet or less in width, a single sweep to the side broom can keep up with our mills. On shoulders wider than 6-feet, you will need to make at least two passes using a sweep-to-side broom. You may want to consider using two brooms to keep up with the milling operation. One mill will generate 15 cubic yards of material in 60-90 minutes while cutting standard 7” x 16” x ½’ cuts on 1-foot centers. 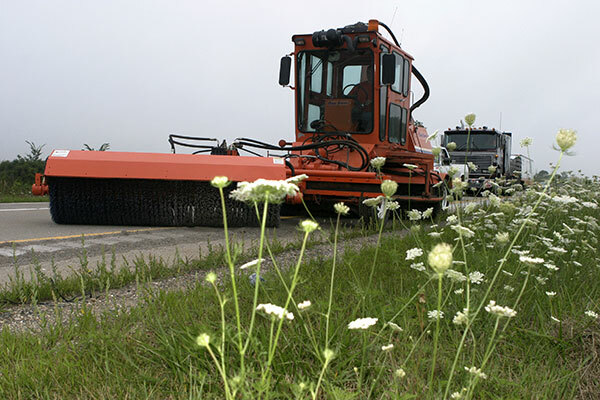 On projects where you must pick up the debris and haul it off the job, you will need two mechanical high-dump sweepers—not vacuum trucks—and dump trucks for rumble strip clean-up.